Fujian is a mountainous province that looks primarily out to the Taiwan Straits and East China Sea and as such it has a certain feeling of independence from China. Indeed it remained the semi-independent kingdom of Min yue ➚ (闽蛮) for the period 330 to 110 BCE before it was conquered and assimilated by Han Emperor Wudi. 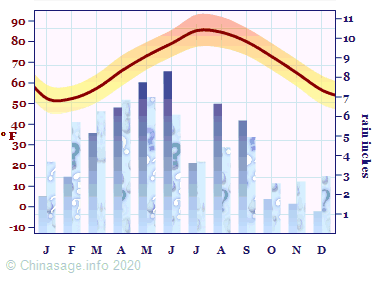 Some people still refer to the inhabitants as Min people. In the last days of the Song dynasty (1276-1279) Fujian was the last refuge from the conquering Mongols. It resisted the Qing conquest in 1644 the longest of all the provinces through the efforts of General Zheng Chenggong ➚ ( Guoxingye 国姓爷 Koxinga WG) who grew up near Quanzhou and used Xiamen as his base. Later in 1660 a Japanese invasion of 6,000 pirates and looters ransacked the province. There is a scattering of old attractive ports and islands along the rugged coastline. 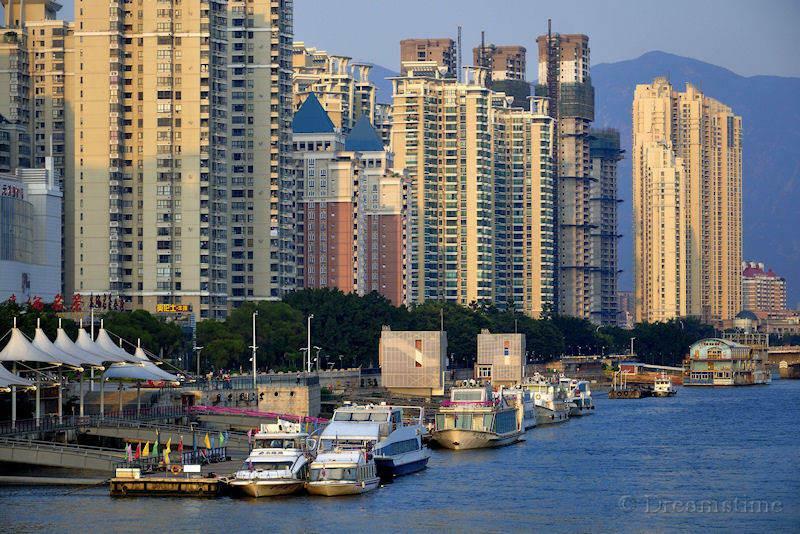 Xiamen (厦门) is an ancient trading port with historical links to the Portuguese, Spanish and Dutch. After the Opium Wars Xiamen came under the control of the British for fifty years. Better known as Amoy following the local dialect, the port and island of Gulangyu faces the island of Taiwan. There are many picturesque islands dotted around Xiamen. Nanputuo Temple ➚ is a famous Buddhist site. Gulangyu island was developed by Britain together with other foreign powers as an enclave, it has long been associated with egrets ➚ and attractive gardens. The Garden of the Countless Rocks (Wanshi Gongyuan) is close by and has pretty landscaped parks and temples. The Lu Xun Memorial Hall is a more modern attraction, commemorating the noted revolutionary writer who lived here in 1926. Lin Zexu ➚ the famous Commissioner who was tasked with stopping the import of British opium was born in Fujian. There is also an Overseas Chinese Museum here documenting the lives of the many who emigrated to foreign lands. The port of Quanzhou (泉州) was once more important than Xiamen, and was visited by Marco Polo and many other foreigners. Quanzhou, formerly known as Zayton or Chinchew, developed during the Tang dynasty as sea trading began to replace overland transport over the Silk Road to become one of China's four main ports. A sunken ship from the 12th/13th century was discovered in the bay in 1974 and is now exhibited in a museum there. The streets were lined with coral bean trees ➚ and it was known as the ‘Coral Bean City’ by foreign traders. Kaiyuan Temple ➚ is an amazing example of Tang dynasty architecture with one hundred stone pillars, it was originally named the Lotus Flower Temple. Here, a 900 year old stone bridge crosses the Luoyang River. It has seven pavilions and nine pagodas on either side. Confirming the dominant role of Muslims in early sea trade, there is a cemetery at Lingshan dedicated to foreign traders and there is Qingjing mosque dating back to 1010. It was from here that Muslim Zheng He set out on his impressive voyages of discovery. 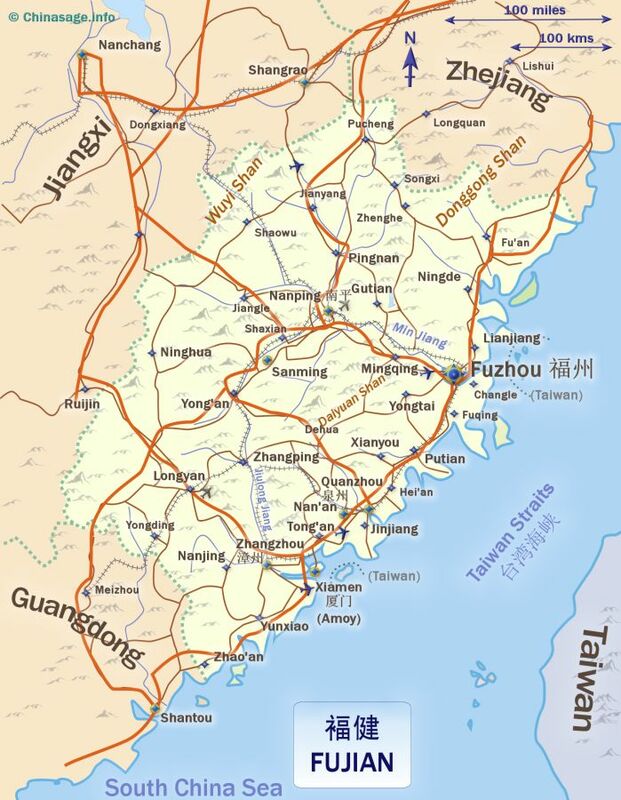 By contrast the capital of Fujian Fuzhou (福州) has the feel of a modern industrial city, but it was a busy port all the way back in the Tang dynasty. There is the Hualin Temple which is of Tang date. Mount Gushan ➚ to the East has a famous Buddhist Yongquan (Boiling spring) temple of similar date. It became a treaty port under foreign control in late Qing times. Not far away up the estuary from Xiamen is the ancient city of Zhangzhou, it is sited on the Jiulongjiang (nine dragon river) it boasts many temples including the Southern Mountain Temple ➚ and the Precious Hall of the Great Hero ➚. Meizhou Island has many temples dedicated to the Goddess of the Sea Mazu, very important to all the many seafarers of the province. Inland near Yongding are the ancient Tulou ➚ houses of the Hakka people can be seen at Fengsheng; Gaobei; Tianluokeng; Hongkeng and Chuxi. They are set amidst the tea growing areas of the mountains (particularly Oolong tea ➚ and Lapsang Souchong) are Fujian's most famous and important crop. The moist air that often hangs over the mountains makes Fujian an ideal location for the growing of tea. The picturesque mountains of Wuyi; Tailao; Nanji; Zhiti; Dongyan and Magu are worth a visit and many of these have Buddhist and/or Daoist temples on them. The high mountains still harbor a few, rare tigers. Jinhu Lake ➚ is widely appreciated for its scenic beauty. Fishing is a major industry of Fujian. The rocky coastline includes many islands and sandy beaches including those near Xiamen; Pingtan and Putian. In scattered towns there are remnants of old folk traditions such as Quanzhou puppetry and a local, distinctive Opera tradition. Handicrafts in lacquer-work, bamboo and shells are available widely. 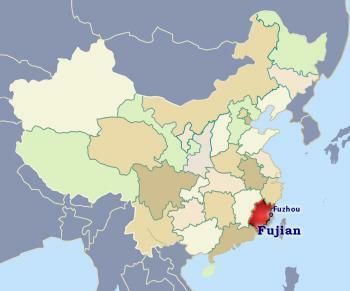 Many of the Chinese diaspora originate from Fujian, some settled on the nearby island of Taiwan which was administered as part of Fujian province in Qing times. With only very poor roads over the mountains, the sea ports of Fujian were used by emigrants to sail away to a new life. Hakka people live in the south west of the province and still use their own language. More recently the defeat of Chiang Kaishek and the Republic of China Nationalists in 1949 led to continuing friction between Taiwan and the Communist mainland. The isolated small islands (Jinmen; Mazu islands) within easy sight of the Fujian coast ‘belong’ to the Taiwan government rather than Fujian and bristle with military defenses. The large, scattered diaspora of Fujianese in Taiwan and throughout south-east Asia has helped their families financially and funded industrial development and universities, as the emigrants still remember their ancestral roots and send money home. Continuing improvement of relations with Taiwan is bringing new opportunities for development. Fujian has a rocky coastline and a mountainous hinterland. Fishing is the main coastal industry while inland it is forestry and tea plantations. It has warm frost-free winters and hot summers, but is subject to damaging floods when typhoons move inland from the East China Sea in late summer. 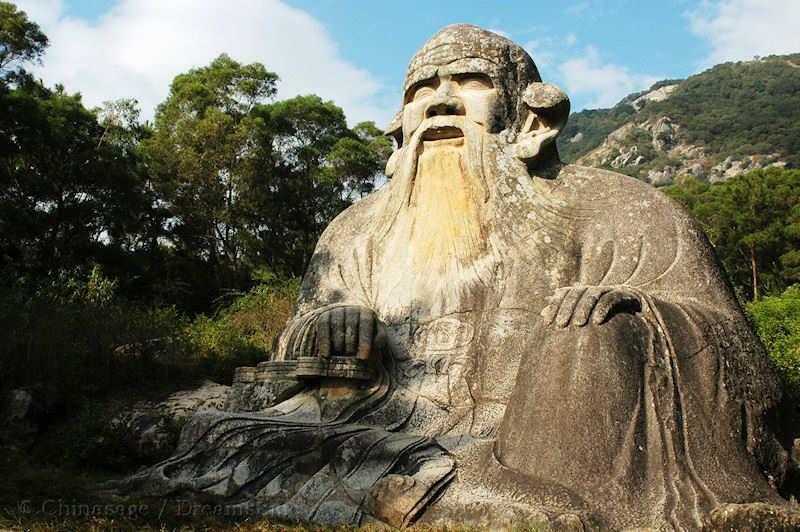 Citation information for this page : Chinasage, 'Fujian Province, coastal China', last updated 29 Nov 2018, Web, http://www.chinasage.info/maps/fujian.htm.